Includes a download of the album "Follow Me Under"
Ward Punk. Swing. Ragtime. Southern jazz. Surf. Van Goat is a band to which you could apply many labels, but none would quite prepare you for what you’re about to hear as you pop on your headphones and queue up their album. Come on down to Mynt's downtown location on April 20th to help shake out some of that spring fever! Off Beat will be bringing in some of our friends to entertain you including Slow Corpse (Ashland, OR), Van Goat (Oakland, CA) and soon-to-be, local legends Duke Fame. Event starts at noon, with music kicking off around 1 pm. Legendary Shack Shakers: The Legendary Shack Shakers’ hell-for-leather roadshow has earned quite a name for itself with its unique brand of Southern Gothic that is all-at-once irreverent, revisionist, dangerous, and fun. Led by their charismatic, rail-thin frontman and blues-harpist JD Wilkes, the Shack Shakers are a four-man wrecking crew from the South whose explosive interpretations of the blues, punk, rock and country have made fans, critics and legions of potential converts into true believers. 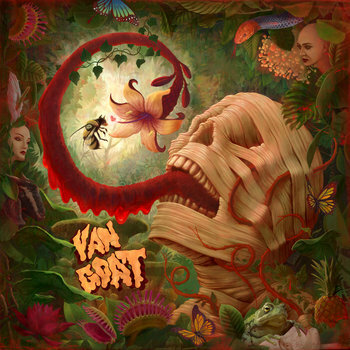 Van Goat takes the tradition of fun, fast, eclectic surf rock started by bands such as Agent Orange, The Pixies, and The Minutemen, mixed with their own brand of swing punk reminiscent of The Squirrel Nut Zippers. Fast, crass, and extremely catchy, Van Goat’s music is defined by constant hooks and changes. Our sound is reminiscent of new bands like Hiatus Kaiyote, Moonchild and Grace Potter yet throwback vibes of Sam Cooke and Bill Withers. We blend soul, funk, rock, blues, and folk into a curated hot plate of musical vibrations that will be sure to move your soul and leave you dancing. Raised in Los Angeles, Ellisa migrated north and found a home in San Francisco’s creative scene, where she wrangled a seven-piece band to play her music. Her sound is honest and textured, combining elements of jazz, soul, and pop. Van Goat returns to The Crepe Place with Fulminante and Salt Petal. All Ages | $10 | Doors at 8pm, Show at 9pm. Fulminante - Latin punk party and mucho mas!